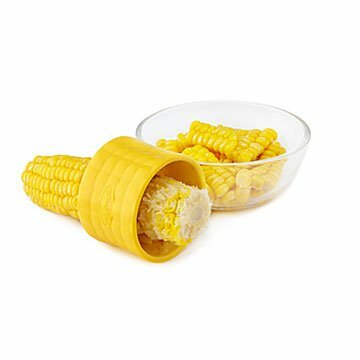 With a simple twist, the stainless steel knife in this tool strips the kernels from any size corn cob. Pan-roasted sweet corn kernels makes summer salads addictive. But slicing them off the cob is a chore. It's easy to injure yourself and hard to cut evenly, because 1) knives are straight, and 2) corn cobs are curved. Here at last is the circular knife you've been waiting for—even if you didn't know it. With a simple twist, it easily strips the kernels from any size cob. The serrated stainless steel blade doesn't come near your fingers. You'll never again dread making your signature salsa for a crowd. Made in China. 2" H x 2.75" Dia.